(Bloomberg Opinion) -- Whatever you think about Vincent Bollore’s motives and approach to corporate governance, it’s hard to argue with one thing: he has generated healthy returns for shareholders of Vivendi SA. That might explain why they voted to approve a new buyback program at the annual meeting Monday, even though it will likely see the billionaire extend his control of the French media conglomerate. If you had invested $1 in Vivendi when he assumed the chairmanship in 2014, you’d have the equivalent of $1.83 in your pocket today. 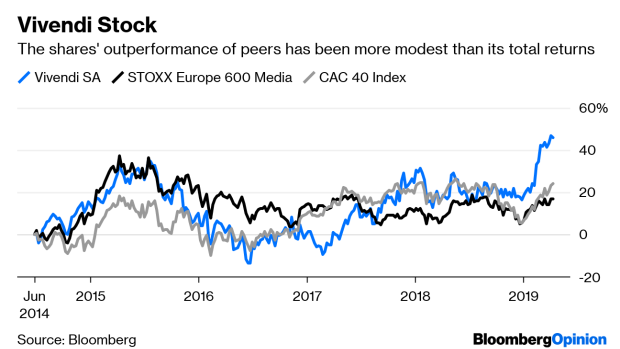 The returns for media firms in the Stoxx 600 Europe Index have meanwhile averaged 32 percent, while France’s benchmark CAC 40 Index has returned 41 percent. Bollore has made savvy use of buybacks and dividends. Without the impact of these, Vivendi’s outperformance would have been significantly more modest. And with each new round of share purchases, the Bollore stake in Vivendi creeps higher. That’s because the family holding company has not sold any stock, and that which was bought back was ultimately cancelled. This has reduced the overall share count, leaving the Bollores with a greater proportion of the total. But the family doesn’t seem to enjoy much support. Only 67 percent of shareholders present voted to carry the measure to allow Vivendi to buy back one in four shares. The turnout (not all investors were present at the vote) suggests that only 17 percent of the stock not controlled by Bollore actively voted in favor of the buyback. The lack of clear backing comes as the 67-year-old prepares to hand his board seat to son Cyrille at the end of this month, having given the chairmanship to elder son Yannick last year. The move to a new generation will breathe new life into the sense that Bollore cares more about dynasty building than corporate governance. The greater concern for shareholders might then be the prospect of another buyback funded by the sale of about half of Universal Music Group, which is Vivendi’s prize asset. By some estimates, the unit could be valued more highly than its parent company’s entire market capitalization. As I’ve written before, the cancellation of shares acquired in that buyback could see the Bollore family secure majority control of Vivendi. Shareholders’ best hope to ensure they're not relegated to be rump investors is that the share price rises so much that it limits the scale of the buybacks. The measure approved yesterday has a maximum repurchase price of 25 euros, and the stock traded above that level on Tuesday. True, Bollore is generating returns for Vivendi’s investors. But they’d better be sure they’re happy to let him run the firm as a family fiefdom in exchange. Alex Webb is a Bloomberg Opinion columnist covering Europe's technology, media and communications industries. He previously covered Apple and other technology companies for Bloomberg News in San Francisco.